Robbers-on-the-lam Seth (George Clooney) and Richard Gecko (Quentin Tarantino) take an ex-preacher (Harvey Keitel) and his kids hostage. On a race to the Mexican border, they rendezvous at a cantina, not knowing the owners and clientele are bloodthirsty vampires. That's when director Robert Rodriguez (Desperado) abruptly switches from hostage drama to tongue-in-cheek, vampiric melee, creating a blood-stained ode to 1960s Mexican horror movies. Download From Dusk Till Dawn in Digital HD from the iTunes store. 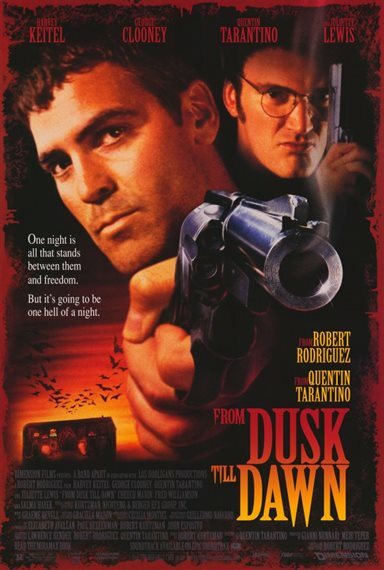 From Dusk Till Dawn images are © Dimension FIlms. All Rights Reserved.